There's a Starbucks that sits at a place where the walls of space, time, and parallel universes is thin. It's where authors and fictional characters go to pick up their coffee. And, of course, it's a particularly entertaining tumblr thought up by two English majors and a history major. Since then, it's already swelled to over 25,000 followers. Something which has exhausted its creators, Jill, Wilson, and Nora. 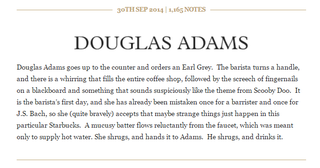 Below are a few favorite entries, but definitely go see the rest at Literary Starbucks.